Those who can stomach market volatility and have a long-term investment horizon may go for these funds. Between June 29, 2014 and June 29, 2015, small- and mid-cap funds were the best-performing category of equity funds, delivering 30 per cent returns. In comparison, diversified large-cap funds posted 14 per cent, while the BSE Sensex delivered 10 per cent, during the period under consideration. According to Janakiraman R., Vice President and Portfolio Manager, Franklin Templeton Investments India, hopes of an economic turnaround resulted in mid- and small-caps outperforming large-cap funds. A significant re-rating of their price-to-earnings ratio (PE) multiples have also contributed to the performance. This, he says, is led by fundamental and behavioural factors. On the fundamental side, when an economy starts reviving, earnings of small- and mid-cap companies witness faster recovery because they are at the tail-end of the food chain - better cash flow helps their working capital needs, and as interest rates come down it reduces their debt and interest burden, allowing faster revenue pick up. On the behavioural side, once the economic recovery starts, there is large domestic participation in the market. As a result, small- and mid-cap companies see higher capital flows and, hence, the stocks witness higher prices. Aashish Somaiyaa, Managing Director and CEO, Motilal Oswal AMC, agrees: "Liquidity chases fundamentals. And, supply is allocated where there is more potential for growth," he says, adding that during the last 14-month-to-date, Rs 90,000 crore flowed into equity mutual funds, almost half of which, i.e., Rs 45,000, was invested in mid-caps. In September 2012, when the markets had hit rock bottom, small- and mid-caps were at their historic lows owing to higher leverage and inadequate demand, putting pressure on the companies. According to Mrinal Singh, Senior Fund Manager, ICICI Prudential AMC, pockets of small- and mid-cap companies are poised to capture the economic recovery which is slowly taking root. "If one looks at the economic data, we are in the early stages of an economic recovery; current account deficit (CAD) is under control, inflation is benign and interest rate cut cycle is underway. With falling interest rates, demand revival and improved investment climate, both operating and financial leverage are likely to improve for these companies," says Singh. Having said that, the stock market is yet to see an improvement in their earnings. "A revival of the capex cycle or the deleveraging of infrastructure sector will support earnings growth, but there does not seem to be visibility on these two sectors getting deleveraged for the next three to six months," says Singh. However, earnings should not worry a long-term investor (three to five years). "Strengthening consumer demand and a deflation in commodity prices, which gives these companies a major cost advantage, will help their margins," says Janakiraman, adding that 2014/15 has seen improvement in performance compared to 2013/14 and is likely to gather momentum over the next two to three years with an expectation of 15 per cent earnings growth. A large number of funds have delivered significant alpha to investors with sound strategies. Multi-cap strategy to value investing: ICICI Prudential Value Discovery Fund, for instance, has managed to deliver consistent long-term returns, outperforming the benchmark since inception (see Leading the Pack). According to Singh, the fund adopts a disciplined investment approach to build a diversified portfolio of stocks having reasonable potential to deliver value to investors over the long-term. It follows an unconstrained multi-cap strategy wherein the mid- and small-cap exposure of the fund is at 50-75 per cent, while some large-caps also find place in the fund. In the past one year, the fund has been overweight on infrastructure and domestic cyclical sectors. Top stocks in the portfolio include ICICI Bank, Reliance Industries, Mahindra & Mahindra, PI Industries and Amara Raja Batteries. "With India on the road to economic revival, these sectors have aided the performance of the fund," says Singh. The price of Amara Raja Batteries, for instance, has doubled over the last one year, while PI Industries saw an increase from Rs 300 in June 2014 to Rs 350 now. Riding on the consumer wave: Franklin India Smaller Companies Fund has been the best performer over a three-year period with 42 per cent returns, as on June 29, 2015. Janakiraman, who manages the fund, typically picks stocks where businesses are profitable but not asset-intensive, and are capable of delivering more cash than what they absorb. His current favourites are banking and wealth management, auto ancillaries, consumer durables, industrials and auto sectors, along with companies that have an intellectual advantage like IT. "The objective of smaller company funds is to identify companies that grow at reasonably attractive rates for long periods of time," he says. 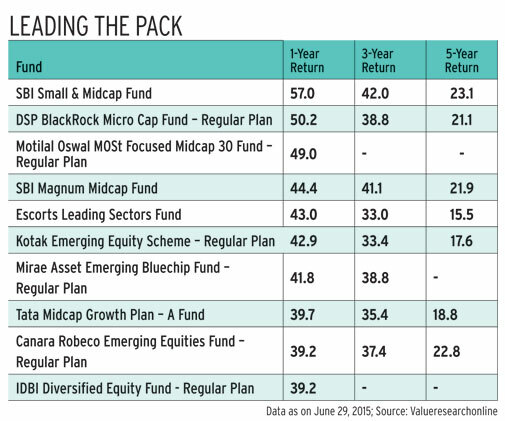 Bordering on large caps: Although it has a limited performance history, Motilal Oswal Most Focused Midcap 30 Fund has been among the top performers in the last one year, delivering 50 per cent returns. According to Somaiyaa, the common thread across all stocks held in the portfolio is that they are not deeply cyclical. "The fund philosophy is to buy companies which are showing secular earnings growth of 18-20 per cent in the last five years and ROE of 16-18 per cent," he says. Most stocks are in the upper end of the mid-cap and lower end of the large-cap segment. Is there still some steam left? Mostly, mid- and small-cap stocks have gone up three to five times. This makes one wonder whether these funds are still good investments. "Valuations are on the higher side and in spite of the tremendous opportunities that lie in the small- and mid-cap segment, extra caution needs to be exercised due to the higher risks they carry," says Janakiraman. Over the last 10 years, mid-caps have outperformed large-caps by one per cent (16.6 per cent), but in the next five years they are likely to outperform by one-two per cent, he adds. Somaiyaa concurs with the view and is of the opinion that the magnitude of alpha seen last year is not sustainable. Having said that, fund managers of mid-cap funds will take into account the high valuations and move out of stocks that have returned fair results, and invest in those that still have some value left. Do remember that when markets do well, mid- and small-caps tend to generate high returns, while in falling markets they tend to suffer. Typically, small and medium businesses are not strong enough to weather bad macro scenario and, if interest rates were to shoot up, their ability to pass on costs is much lower than bigger companies. Analysts say one must invest in funds with a lower turnover ratio (less than 0.5) and those which have performed through various cycles, comparing their performance vis-a-vis their benchmarks. Investors who can stomach market volatility and have a long-term investment horizon may allocate a portion of their portfolio to small- and mid-cap funds. Equity is a volatile asset class and mid- and small-caps are even more volatile. According to Singh, investors can manage this volatility by increasing the time horizon. If you have a three-year horizon, you are better off investing in large-cap funds, for longer horizons you should consider investing in mid-caps. The key is to identify prudently-managed mid-cap funds. 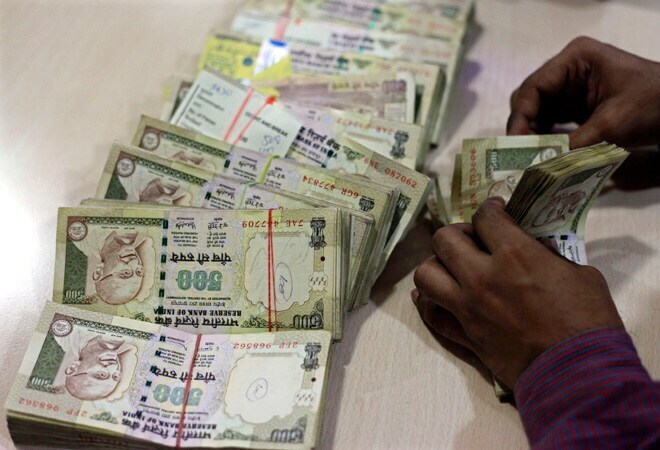 According to Janakiraman, a 40-year-old investor could invest up to 25-30 per cent in mid- and small-caps. If one assumes that economic recovery will last for five years, earnings growth will show great returns from here on, considering that the returns are due to re-rating. In the next four to five years, the market is expecting 15 per cent plus earnings growth. With the Indian stocks market trading close to a 10-year average, investors are likely to be the winners.